These castings are an alternative option to the pressed steel supports and are designed to prevent flexing of the rocker shaft which in turn assists in maintaining accurate valve timing throughout the rev range. We have our castings precision CNC machined here in Yorkshire with the rocker shaft eyes being reamed for perfect fit. These are usually in stock and is a part for the enthusiast who is seeking to maximise performance and reliability. These castings are suitable to use with both the standard camshaft arrangement seen in the photo below on the left and the big cam conversion highlighted in the photo on the right. 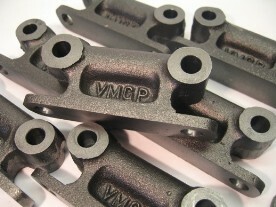 Initially we only had our VMGP castings poured in SG iron and mainly for those enthusiasts wishing to fit the large camshaft conversion to the J Type. However, these have become a popular product for M and J Type owners who are building standard engines. As the standard J Type pedestal castings were originally cast in bronze, we have decided to offer a choice whereby the standard J Type can now have a full set of matching bronze castings. We also manufacture the special hybrid P/J rear camshaft support casting for the big cam conversion and we are happy to provide further information regarding the whole set up on request. Please also see our rocker shafts and bushes again as also shown above. 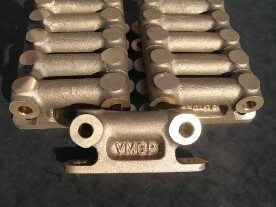 This part must be used in conjunction with a single bracket rocker cover securing plate.